2015 will be a year to remember for Princess Cruises as the cruise line has announced a load of celebrations to be held across it;s fleet all through the year. Passengers will get to enjoy a wide range of organised celebrations to mark the cruise lines 50th Anniversary and we’re sure the crew will get some special parties too we hope! To honor the iconic role The Love Boat played in the line’s history, a new Love Boat Disco Party will celebrate the beloved program by creating an exciting 70’s theme night with a few surprises. Movies Under the Stars will showcase video messages from the original Love Boat cast, special montages from the show, a Love Boat sing-a-long and show trivia, 70’s music videos and even a live kiss cam. The party will also feature a production number, a celebration of weddings and anniversaries of guests onboard, a photo opportunity with a Love Boat life ring and plenty of dancing with a party band. One night on every cruise, the main dining rooms will present a special souvenir menu, featuring commemorative dishes from the past five decades, including Duck Terrine with Apricot Preserves and Filet of Turbot with Truffle Chive Sauce. Known for offering “the best pizza at sea,” Princess chefs will also introduce a variety of new anniversary pizzas such as Spicy Tomato & Shrimp, Potato, Bacon & Brie and Thai. As part of the new “Chocolate Journeys” experience, renowned master pastry chef and chocolatier Norman Love has created two special 50th anniversary desserts that will be served to guests during their cruise vacations – Chocolate Raspberry Mousse with Vanilla Creme Brulee and Crunchy Shortbread or Moist Chocolate Dome with Raspberry Creme Brulee and Bittersweet Chocolate Mousse. These two desserts will alternate from one voyage to another. Guests can sip inventive cocktails from renowned mixologist Spike Marchant along with popular drinks through the decades – from a classic martini to a pina colada. A special half-bottle anniversary-labeled Prosecco will be offered and the new Seawitch West Coast IPA craft beer especially brewed for the 50thanniversary will be available. A 50th celebration in the signature Piazza will feature a golden balloon drop and some balloons will even feature surprise giveaway items hidden inside. A special anniversary song, “Here’s to Princess,” celebrating the line’s history will also be performed. Guests can also compete in exciting game shows and test their knowledge with the Princess Trivia Challenge – 50th Anniversary edition. Plus, on select sailings, guests can dance to the music of tribute bands – like the Beatlemaniacs – bringing the greatest hits over the decades to life. Anniversary decor and signage will be displayed from the time guests arrive in the terminal (domestic home ports only) and be visible through various onboard touches, including a spectacular anniversary display cake presented in the atrium. A 50th anniversary tote bag and commemorative time line will be placed in each guest stateroom upon embarkation. In addition, guests will notice the 50th anniversary logo on their stateroom key cards and on the daily Princess Patter. A series of videos will also play on stateroom televisions that share the company’s history and milestone moments. Each cruise ship in the fleet will also be adorned with a 50th anniversary flag on the bow. The onboard boutiques, voted “Best Onboard Shopping” six consecutive years by Porthole magazine, will offer limited edition merchandise and exclusive offers during the anniversary celebration. Plus, the photo department will have commemorative backdrops and folios to capture the memories of guests’ cruise vacations. 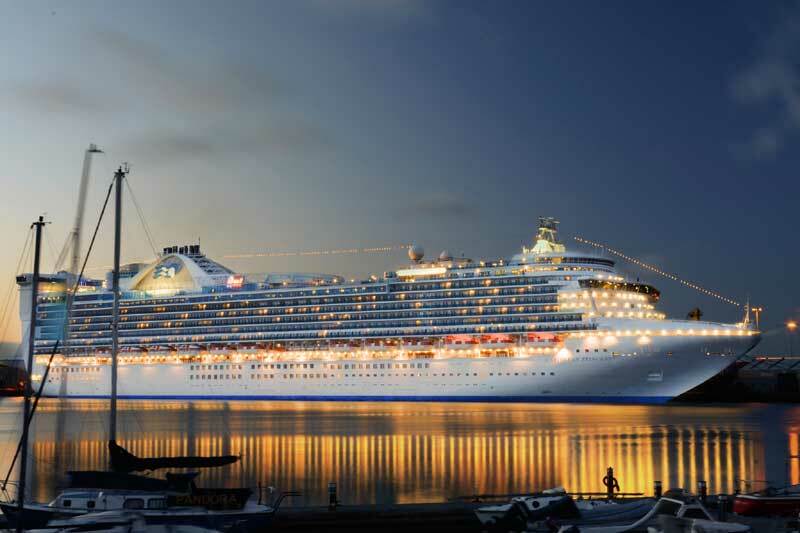 The 50th anniversary officially kicks off with the naming ceremony of Regal Princess on November 5, 2014, in Ft. Lauderdale by the original Love Boat cast members before she sets sail for her maiden season of Caribbean cruises. Some of the 50th anniversary onboard offerings will be available aboard Regal Princess beginning in November and roll out to the rest of the fleet in early 2015.